It has a stupid name. "Final Fantasy ex divided by ex minus 2... Is that Maths?" No. It's Final Fantasy 10 and 10-2. 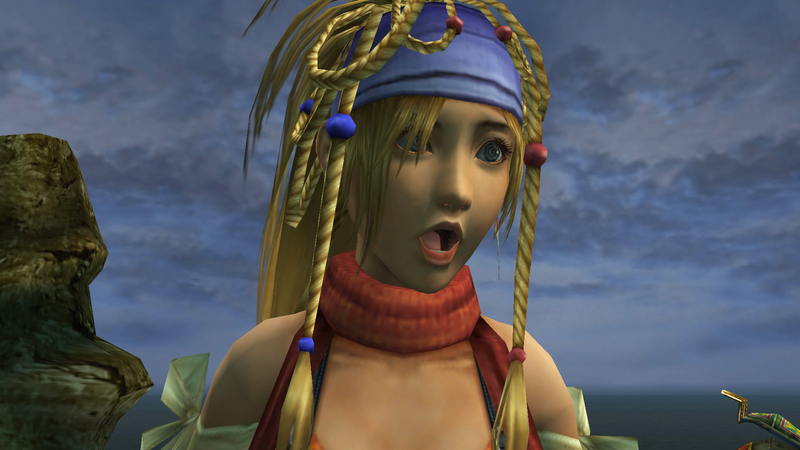 "Do I need to play Final Fantasy IX before playing Final Fantasy X?" No. All of the Final Fantasy games are different stories about different people in different worlds. X and X-2 was the first time in franchise history that a Final Fantasy game's story was continued in a sequel. Besides, Final Fantasy IX wasn't all that great. "What does HD Remaster mean?" These games originally released on the PS2. Now that the PS4 is out, the games are being remade on the PS3....and PlayStation Vita. It would have been better if they named it "Something Original" and "Something Original part 2". The characters are too hot. HowLongToBeat says Final Fantasy X's main story takes 48 hours to complete, not including side missions. If you want to include all the extras, it's more like 176 hours. Planning to play X-2 after X? That's another 101 hours. Did I mention extra missions have been added to the HD Remaster Version? I hope you don't have a life outside of video games, buddy! The PS2 Version didn't have trophies and it was perfect. Now that Square Enix has added trophies, they've ruined everything! Didn't I tell you how much content is in this package? There'd better be an Unobtanium Trophy to go with that Platinum! If it were just long and had a zillion trophies, that would be one thing -- uh...two things -- but it's addictive too which means you'll need rehab after playing this. Do you know how expensive rehab is?! 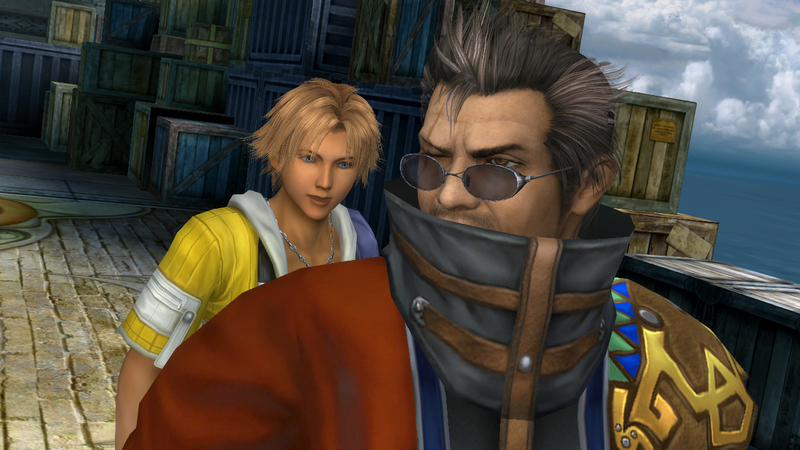 Tidus and Auron. "Why can't I quit you?" There's some effed up stuff that happens in this game! When you beat it, you'll probably say, "What?! No no no no NOOO!" Do you really want to go through that? These ain't tears; these are "Man Tears"! It will mess with your head. This game has so many plot twists and character relationships that you would need to be a genius to understand it all. "So you're telling me that his father is Darth Vader, Tom Riddle is Lord Voldemort, and the key to time travel is the flux capacitor?!" Theer's a sercet lnagauge in the game taht youl'l hvae to laern if you wnat to unlcok some exrta cnotent. "'Learn another language?' I barely know English! Ain't nobody got time for that!" So, you beat Final Fantasy X-2 following the official guide and did everything you could have possibly done. Then why don't you have 100% completion? It's impossible to do everything in one playthrough; you'll need to beat it at least twice. Unless you're Chuck Norris. You will be associated with those people. Nearly 7 million people purchased Final Fantasy X when it was released on the PS2, and most of them are crazy about the game. Some of them may actually believe they're the characters from the game. You're thinking, "Do they dress like this every day? What a bunch of weirdos...," right? As you can see, there are plenty of reasons why you should avoid these games. If I had to say something good about Final Fantasy X / X-2 HD Remaster, however, I'd say that the music is pretty awesome. And there is Cross-Save functionality between the PS3 and PS Vita. Other than that, I really can't say. But what do you say? Will you be getting Final Fantasy X / X-2 HD Remaster?